Ran into a strange issue today with two Citrix servers, both suddenly started to exhibit extremely long logins of ~3 minutes – this initially meant that users could not access any published applications on the servers due to the default LogoffCheckerStartupDelayInSeconds timeout of 60 seconds. Sessions would start, hang at the “Welcome” stage of the Citrix application startup and then the session would terminate after 60 seconds. We modified this registry key to 180 seconds and applications would then launch, workaround in-place, but what was really causing the issue? After a LOT of troubleshooting it was discovered that there were 100+ profile folders on the servers. We scripted cleanup of these profiles using the script below, login times dropped to ~25 seconds. It may be that like me, you have Citrix servers in one time zone and users in another. It is possible to configure per-session time zones based upon the connecting client device time zone. I have tested this with XenApp 5.0 running on Windows Server 2003 R2 x64 SP2, with clients connecting via Citrix Online client v10 & 11, RDP and Itium thin client devices. This requires no reboots of any kind, a new session logon should show that the redirectionis working. Author Chris BradfordPosted on 26th November 2009 Categories Presentation ServerLeave a comment on Citrix : The RPC server cannot be contacted on server . I have gathered a list of registry and operating system tweaks that improve Citrix performance. I use these tweaks on all Citrix servers deployed in order to ensure reliable performance when under heavy user load. I was recently tasked with troubleshooting very poor performance on a Citrix Presentation Server 4.5 Advanced Edition Farm. Your first port of call should be server specification: is the server ‘man’ enough for the task being asked of it? Use the built-in Windows Performance Counters to troubleshoot here. Check you CPU usage and troubleshoot specific processes if your CPU utilisation is very high. For my environment CPU usage was at < 5%; this was not the governing performance issue. Memory utilisation can also hinder performance. As a Citrix server runs out of RAM the number of pages /second dramatically increase. Memory usage was circa 50% and the number of pages /second was low. Network utilisation; whilst ICA is a low-bandwidth application other applications on your environment may be increasing network latency due to saturation of the network link. Use the built-in Windows Performance counters and your switch management tools to ascertain if this is your governing issue. For my environment network usage was < 5% on a 100MB Full-Duplex link. Are there specific problems with your network that are causing peaks in latency and dropped packets? Using the Metaframe Servers SDK (MFCOMSDK) v2.3 tool; smcconsole.exe I was able to monitor individual user sessions. Using this tool you can view individual sessions bandwidth utilisation and latency. This tool is incredibly useful when troubleshooting issues regarding session performance. Session latency can also be viewed using the WMI performance counters for ICA Session that are installed when Citrix is installed on a Windows Server. The image above shows a latency figure of 32ms. This equates to 0.03 seconds – a more than acceptable latency figure for an ICA session. When troubleshooting my issues I was receiving figures of 27000ms (yes, 27 seconds!). Let me explain the command. The ‘-t’ option forces the ping to repeat until instructed otherwise (i.e. cancelled with Ctrl-C). The ‘-l 1472’ option sets a packet length of 1472 bytes; there is a 28byte packet overhead therefore, the total packet size is 1500.Finally, the ‘-f’ option forces the packet to not fragment over multiple packets. First, verify that the MTU for your network is in fact 1500 bytes. You can verify this by using the same test to other servers and devices across your network. If you see many dropped packets you know there is a network fault, which may well be the cause of your performance woes. Using this test I identified that there was a fault. The next step is to identify where this fault is occurring. Use ‘tracert’ to identify the path that your packets travel in order to reach your citrix server. Then perform this loaded ping test to each of these addresses one at a time. ‘Speedscreen’ is a very useful feature built in to all versions of Citrix Presentation Server 4.. Configuring this feature is remarkably easy, but it is also remarkably easy to overlook. You can see that this server has been configured for SpeedScreen on all of the listed executables. To add SpeedScreen functionality to another application simply click ‘New… ‘ you will then be presented with a Wizard which will ask you to browse for the desired executable to utilise SpeedScreen with. If you have more than a couple of Citrix Servers in your environment the last thing you want to do is set this up manually on all servers. There is a very simple and quick way of replicating your SpeedScreen configuration between all servers. Provided you have enabled Speed Screen at the Farm level via the Access Management Console you’re good to go! Understanding and configuring the Citrix XML Service’, ‘Recently caught out by modifying the Citrix XML Service port I thought I would share my experiences! You’ll find that without this if the first server in the list goes offline the TC devices will NOT connect to the next server in the list. After a long project that was aimed at improving Thin Client performance I though I would post my experiences and solutions in order to aid those in a similar situation. I was recently tasked with improving a Citrix XP and PS 4.5 Farm’s performance; by no means was this simple project which I could simply throw more servers at the farm hoping to resolve the issue. By far, the most useful tool in diagnosing slow logons is the userenv.dll debugging available in your Windows out of the box. This will really spell out where your problem is coming from. External file servers, especially servers holding roaming user profiles can cause significant delays; if these are running out of free connections or worker threads then logon delays are inevitable. To Diagnose: Use userenv.dll debugging – http://support.microsoft.com/kb/221833– log file is located under %Systemroot%DebugUserModeUserenv.log. Solution: Watch out for ‘Srv’ events in the System Event Log with Error code ‘2022’; see the following KB article for more details: http://support.microsoft.com/kb/317249I would definitely suggest rolling out the MaxFree Connections /MinFree Connections registry tweak described in more detail here: http://support.microsoft.com/kb/830901 Note that Windows Server / Advanced Server 2000 require a hotfix, which is free to obtain form MS Technical support.The following web site is also a great resource: http://support.microsoft.com/kb/324446 – if you’re running RAID cards with battery backup units get the Delayed Write Cache setting enabled! NOTES: Please note that Microsoft does not support the use of PST files across a network. This can cause significant performance issues to file servers hosting them. For further details please see: http://blogs.technet.com/askperf/archive/2007/01/21/network-stored-pst-files-don-t-do-it.aspx If you’re hosting PST files on the same server as your profiles you’ve more than likely found your problem. I would suggest separating the profiles and PST files on separate servers. Profile access needs to be quick to ensure smooth logons. Slow access to domain controllers, namely Global Catalogue (GC) servers can cause significant delays in logon as group memberships are referenced and permissions are established from the Active Directory.If you have only a single domain in your forest each Domain Controller can be setup as a GC server. In a multi-domain forest you should ensure that the Infrastructure Master FSMO role is not placed on a GC. The first DC in a domain is always automatically configured as a GC, subsequent DC’s are not. To Diagnose: Use userenv.dll debugging – http://support.microsoft.com/kb/221833 – log file is located under %Systemroot%DebugUserModeUserenv.log. Solution: Setup dedicated DC’s; DC’s are central to yourActive Directory Domain. Quick access for LDAP queries is essential for performance. Running print/file server roles on these servers is simply not smart and not reccommended. There are many myths about the number of users you can effectively have on a single Citrix server. I have seen single servers handle 60 users without any issues what so ever. I have seen servers struggle to handle 20 users when applications or external problems, such as file server access, can cause slowdowns. There isn’t a Citrix reccomended number of users per server. This limit is dictated by the applications your user operates during their session. The only way to find out what your Citrix servers can handle is to test them. Symptoms: High CPU/ Memory / Page File usage on all Citrix servers within a farm. 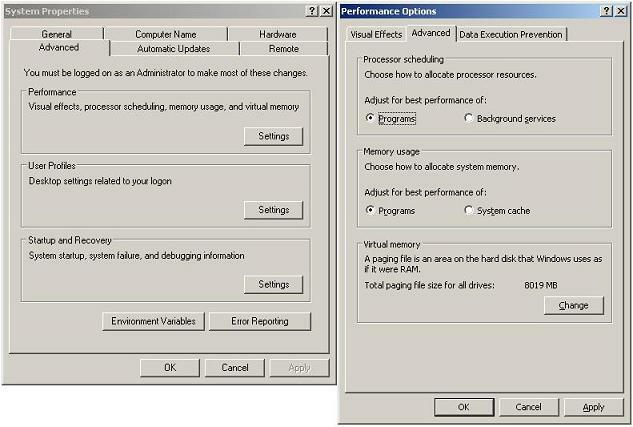 To Diagnose: Create a performance benchmark using the built in Window Performance counters. You’ll know if this is an issue when you examine the results. Solution: Setup and introduce further servers into a farm. Unless you’re seeing high CPU/RAM usage there is little point in adding more servers to the farm; your problem is elsewhere my friend. Symptoms: Long pause after the ‘Applying your personal settings’ box disappears. To Diagnose: Test a user account with the same profile settings other than logon script; ensure it has no logon script. Solution: Scale back / Streamline your scripts where possible. Alternatively you’re looking at a long night rebuilding them. There is no one-fix-fits all here; your scripts are bespoke to your network… good luck! UPDATE 31/01/2008: Simple, yet easy to overlook is the Network Adapter configuration. Solution: The cause was simple; a network configuration mismatch. The switch to which the serevr was connected was configured for auto, as was the server. The link infact had auto-negotiated to 10Mb Half Duplex. Forcing the server to 100Mb Full-Duplex reduced logon to around 15 seconds.This can be explained by the use of roaming profiles. The delay was caused by the slow NIC configuration. This means that copying users roaming profiles took up to 5 minutes prior to logon. UPDATE: 27/09/2009: Antivirus software should be installed and configured correctly for Citrix XenApp/Presentation Server in order to ensure that there is no performance overhead. Symptoms: Generally slow performance across all applicationsand file access. UPDATE: 11/11/2009: If using McAfee Virus Scan 8.7i ensure that at least patch version 2 is installed. UPADTE 26/02/2010: I thought I would streamline this article, incorporating an additional troubleshooting step from another article in the cb-net archives. To Diagnose: Use the Metaframe Servers SDK (MFCOMSDK) v2.3 tool; smcconsole.exe. Using this tool you can view individual sessions bandwidth utilisation and latency.This tool is incredibly useful when troubleshooting issues regarding session performance. Session latency can also be viewed using the WMI performance counters for ICA Session that are installed when Citrix is installed on a Windows Server. Solution: When troubleshooting my issues I was receiving figures of 27000ms (yes, 27 seconds!). I have seen latency figures as high as 27,000ms (yes, 27 seconds!) due to NIC / switch port mismatches. Symptoms: Generally slow performance of virtualised Citrix servers, especially on AMD ESX/ESXi virtualisation platforms. I had similar issues with physical servers which had been converted to virtual servers.